In between frantic rooftop escapades in Mirror's Edge, I had a chance to read a scrolling in-game news bulletin. It warned parents that a fondness for the color red may be a sign their child is a runner, the game's version of a rebellious UPS driver. In a world this white, it is hard not to be drawn immediately to anything red. Most things are painted in either of these two colors. Beyond making the Mirror's Edge world look like a giant Target commercial, the contrast between red and white serves a functional purpose. When something on screen is glowing crimson, it lets the player know this object is useful for maneuvering through the environment. The game calls this "runner vision." I call it a failed attempt at player guidance. The justification for seeing red is this: it simulates how useful objects may stand out to a highly skilled runner like Faith. I reluctantly accept this explanation. Most games rely a similar excuse to account for weapons glowing, or any other attention getting device. However, when the creators shepherd me through an experience, I can't help but feel manhandled. Most scalable objects in Mirror's Edge do not glow red consistently. They often blend in with all the other white objects, only appearing red when nearby. Personally, I found this to be their biggest flaw. Countless times I would leap towards a distant ledge, pipe, or over hang, not knowing if it would change color or let me fall to my death. My training was not to move effortlessly through my surroundings, but to seek out objects that might become red. This off-and-on nature of the guidance system snapped me out of the experience, even more so than dying over and over and over again. Dice studio saw fit to include one other directional assistance mechanic. With the press of a button, Faith can turn and look towards her primary objective. This was even more of an abysmal failure. The entire point of the game was to find a path towards a single location, a path that is almost never a straight line. Getting to a distant door or ladder is an action composed of many small steps. The immediate goal of finding the best route to move forward trumps the long term locational goal and makes this function essentially useless. I am not strictly opposed to a little direction. Fable II's glowing breadcrumbs were not jarring in the slightest. Unlike Mirror's Edge, this trail of goodness is always present and can be set towards various locations of your choosing. The subtlety lets the line fade into the background whenever you choose to forge your own path. Like a parent teaching a child to ride a bicycle, you should easily forget the guiding hand is there and soon be able to ride all on your own. To carry this bicycle analogy one step further, needing this assistance at all is a sign the bicycle was not built with training wheels. You wouldn't need the developer's artificial touch if the game could be "ridden" on its own. 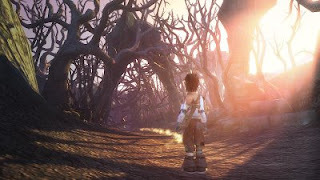 Though Fable II's trail does not draw attention to itself the way red-vision does, it is still included to replace a coherently structured and easily managed level design. Perhaps Lionhead Studios removed a map display to clean up the HUD. Or arguably, the expansive free-flowing nature of Fable II makes an easily maneuverable experience impossible. Regardless, any guidance system exists when the ideal (the player leading themselves) cannot be met. Of course in Mirror's Edge, and Fable II, I can turn this assistance off. However, in doing so, the whitewashed buildings, without the red contrast, lose some of their meaning and become more boring than they were to begin with. Effectively, seeing red is a less than perfect band-aid for other game flaws I hope to cover next week. Again, I am no proponent of game difficulty for its own sake. I'll gladly accept a helping hand when appropriate. It is when this hand is wearing a ruby encrusted glove that glitters in the sunlight that I am inclined to let go. When I read the title of your post, I thought you were going to say your 360 just red-ringed ;-). I find your "training wheels" metaphor very interesting. Most games have a learning curve that acts as a set of training wheels: levels or objectives start easy and get progressively harder. It seems like Mirror's Edge and Fable 2 are two games where the training wheels never really come off. Did you, or any other readers feel this way? 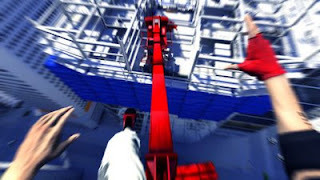 Simply from playing the demo, it seems to me that the "training wheels" in Mirror's Edge are necessary, simply because of the fact that many of the things that seem logical to jump to/climb on are in reality just pretty scenery. No one likes to fall to their death because of a pole or ledge that looked ripe for climbing. But Jorge, I don't know if you should be allowed to make any bike analogies, unless you've recently made up for your deprived childhood and have learned to ride one, hah. I once had a red ring and panicked, but then it went away. Since then, each day, I burn a Dreamcast game to feed the hungry videogame gods. No game is created specifically to frustrate the player for the joy of it, except Megaman 9. But if we need the help enough to need something so noticeably and obtrusive, then we've got to question whether the game actually works as it should. Though I kept the runner vision on, within the first few levels I found that ultimately I didn't need it. If you pay attention to what is coloured red, that is to say what the object itself is and not merely that it's coloured red, you will learn quickly which type of object and ledges you can interact with and which will always be scenery. If anything the crutch of the Runner Vision can lead players into a flawed mindset, where instead of looking at the objects in the world and whether they can be interacted with players would instead look for objects that turned red. This is especially problematic in the later stages of the game because by then very few of objects are actually highlighted with runner vision at all. At least they weren’t for me, I wonder how much the Runner Vision relies on how long you stand around staring at things? The game tries to teach you through Runner Vision what type of objects can be used, but instead it merely encourages players to look out for red objects and only try and use them. I can honestly say I never once got lost in Mirror's Edge all my frustrations were born of not either not being able to build up enough momentum or forgetting particular movement ability was available to me.